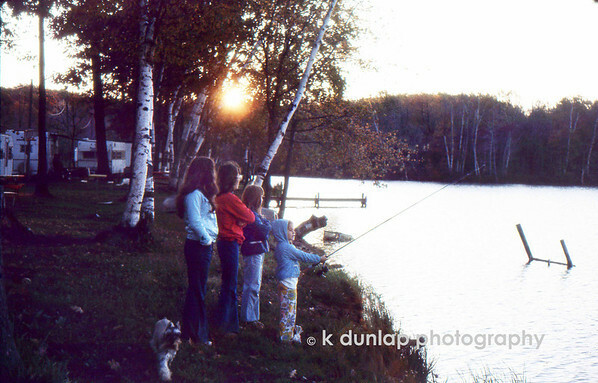 Since I am in the middle of my big slide scanning project, I thought I would dedicate and make all my Friday posts a “Flashback Friday” of an old family photo. Now I know what some of you are thinking, I’ll post all the crazy one’s of everyone but myself, but I have to tell ya’, the only really crazy picture’s are of me anyway so… I can’t take credit for any of the photo’s either, they are all the work of many years of my father. So kudos to you Dad! Hopefully I can get them scanned and saved before we lose them. I just liked this photo of the four of us looking out onto the lake, from one of our many camping adventures. Ahh, the peacefulness. Was this before or after the fight for the fishing pole?